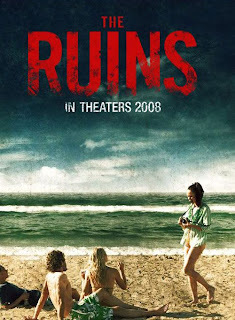 This is probably a perfect poster for The Ruins, because, like most movies, the less you know about it, the better. In short, it's about four people on vacation in Mexico, who bad stuff happens to. But there is a point in The Ruins, when you realize what the main premise really is, when you'll either write it off as the stupidest idea ever, or you'll just buy it and hang in for the ride. Luckily, I'm in the latter category. The Ruins takes a simple idea, sets up some characters just enough so you care about them, weaves a simple plot around the idea, and takes it to its logical conclusion. It's not gonna win any awards for subtlety or depth, but there is a nice attention to detail, and it does what it does very well. And what it does is gross you out. Make you squirm in your seat. Maybe even barf a little. As someone who's watched many, many horror movies, it takes a lot to accomplish that goal with me, but even I found my face twisting with horror at some of the stuff in this movie. If you're into that sort of thing, The Ruins is highly recommended. What's this I hear about a moustache??? Sarah: Uh DUH, it's Movember. It's attached to a beard right now, so it's not a true moustache, but that beard is coming off sometime soon. Sass: Hehe, I did email her. I'm so looking forward to the buttons. I will wear them everywhere. I do! I have her button on the neck of my winter jacket. we're like style buddies.